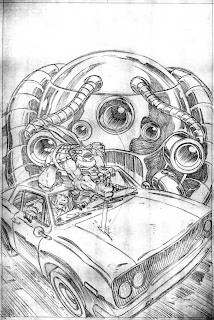 Here's my pencil drawing for the cover of the second issue of the Mirage TMNT color series, before Kevin Eastman inked it and I colored it in Photoshop. This is one of a series of "big head" covers that we did for that series, wherein the background of each cover was dominated by a large image of the head of one of the characters in the story. didn't you also pull the TERRORPIN cover ( V. 2 # 5 ) .. ?! I coulda sworn i saw one of the pix of your table and there was a recolour of that one as well you were signing. !! -->> in the fluster of yesterday i kinda lost focus..
..but Pete .. i think this is another 'Re - post ' on a re-post .. isn't it.. ?? Or are you just adding to update your old posts from Planet Racers ?? O god i don't know. .. but again you may have re-posted this for your own records, the scan on 103 is larger than this one, tho'. Hiya Pete, any chance of seeing those reworked versions?